Richard Renaldi's News and Events: Joey Chestnut wins in Sudden Death! Joey Chestnut wins in Sudden Death! 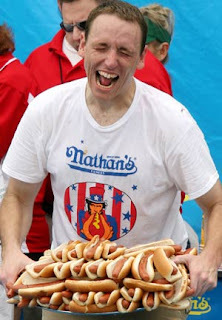 Nathan's International July Fourth Hot Dog Eating Contest has always fascinated me. The six time champ Takeru "Tsunami" Kobayashi went down last year to newcomer Joey Chestnut from California. This year they ended up in a tie - each eating 59 hot dogs in under 10 minutes. The first tie ever they faced a sudden death challenge - who could eat 5 dogs the fastest. Chestnut came out on top defending his title.